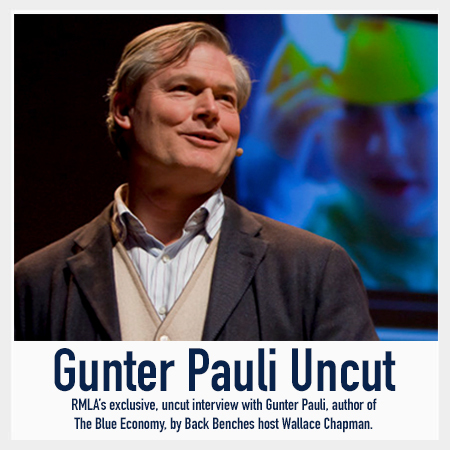 Gunter Pauli, Founder of Zeri and author The Blue Economy, addresses RMLA members in an exclusive interview with Back Benches host Wallace Chapman. In an inspiring address, Gunter Pauli cuts a clear path to the circular economy by demonstrating the viability of using what we have. He describes lucrative business ventures that produce ‘stone’ paper from mine tailings and do away with the need for monoculture paper & pulp forests; companies that produce planet and people-friendly detergents from orange peel waste; and alternatives to intensive agriculture that solve pending water and food crises.